Maj Gen RISTUCCIA graduated from the Italian Military Academy, in Modena in 1987. He then graduated from the Scuola di Guerra, the Italian equivalent of the Staff College, in 1998, and the Istituto Superiore di Stato Maggiore Interforze, the Italian equivalent of the Joint Services Command and Staff College, in 2002. Maj Gen RISTUCCIA spent the majority of his career serving in the 3/5th Field Artillery (MLRS) where he commanded at multiple levels including XO, Btr Cdr, Bn Cdr, and Rgt Cdr. When not in command and working for the Italian Army General Staff his focus was the G1 Functional Area. Additionally, in 2009, he was deployed as the UNIFIL Force Commander Special Staff Chief. 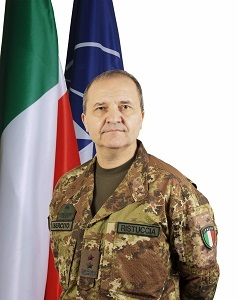 After commanding the 5th FA Rgt (MLRS) from March 2010 to September 2012, Maj Gen RISTUCCIA was assigned to the Italian Army General Staff as Chief of the office in charge of HR (Officers) management. In 2014, he attended the French 64th class of the Centre des Hautes Etudes Militaires, at the Centre for Higher Military Studies, and the 67th class of the Institut des hautes Etudes de la Defense Nationale at the National Defence Institut. When promoted to Brig Gen in July 2015, he became DCOS Support, Northern Defense Forces Interregional HQ in Padova. From June to November 2016, Maj Gen RISTUCCIA served a tour of duty as Operation Prima Parthica IT NCC-L in Erbil, Iraqi Kurdistan. In December 2016, Maj Gen RISTUCCIA assumed command of 132nd Ariete Armoured Brigade. In this position he led the 2017 NRF Stand-Up Brigade and the 2018 VJTF (L) Brigade. On January 14, 2019, Maj Gen RISTUCCIA became the Chief of Staff of NRDC-ITA. Maj Gen RISTUCCIA is married to a junior high teacher and they have an eighteen year old daughter, Eleonora. He is fond of basketball and tennis.